For dieters about to embark on their next "miracle" diet, I recommend that they first read and digest this eloquent and potentially life-changing book. In this stunning book, author Linda Moran reveals the naked truth about dieting: that, in the long run, restrictive eating doesn’t work for most dieters. That when dieters deny themselves delicious and full-fat foods, they are fighting an innate and ingrained biological drive designed to help the human race survive--a battle dieters are not likely to win. So if a potential dieter wants to lose a few pounds, forget about it, accept one’s fatness, and move on, right? Moran, owner of the Yahoo! Dietsurvivors: Non-dieting for Intellectuals Health Group http://health.groups.yahoo.com/group/dietsurvivors/ offers an alternative to dieting: intuitive eating. In the chapter "How Children Eat," Moran asks the reader to observe children at the table: intuitively, they eat when they’re hungry and stop when they’re satisfied. They’ll leave a cookie on their plates without feeling guilty about starving children in some third world country. Moran says that former dieters can train themselves to eat like children, to enjoy what they really want of that cookie and throw the rest away, without feeling deprivation or guilt. I’m not saying, ‘Don’t diet.’ Rather a diet is a lion to be tamed by you. 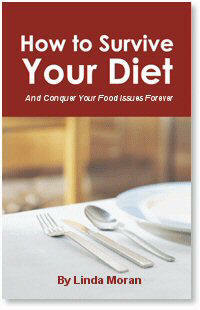 Too often, the diet becomes the Truth, an all-or-nothing proposition resulting in black and white thinking. Moran concedes that diets do work for a few dieters, but emphasizes that "a diet works best if the dieter doesn’t take it too seriously." In other words, a diet should not be worshiped as the "god" of the moment, but, rather, be used as a tool for helping the dieter make effective and sustainable life change. All foods should be "legalized"
Moran doesn’t claim that the work of intuitive eating will be easy, recognizing that it takes time to unlearn old diet rules and incorporate new thinking. Furthermore, she offers her own story only to establish her credibility and to show her own path to eating enlightenment, not to impose new rules on the reader. This book is not about rules, but about your thinking. My suggestions may or may not work for you. It’s more important that you take ownership of your eating, learn to apply reasonableness as a standard instead of calorie counts or scale numbers, and start to use your own judgment about the advice you hear. Especially, you might find suspect anything that sounds too black and white. The author does not claim to have all the answers, which, in my opinion, strengthens her credibility and establishes her as a true pioneer in the weight management industry. Doctors and psychologists might do well to give their patients a copy of Moran’s book. i'm carlo i'am in office right now, but i haven't nothing to do so i'm thinking and moving around in the web. For that reason i found out this blog. and i'm reading something. i'm italian. i live in a city near Venice. See ya was good to write to u!